Well, it’s nearly the first Friday of the month which means it’s time for Field Trip Friday. My family has taken our classroom out into the world quite a bit lately. Last week we attended a special program at Earlyworks in Alabama and traveled back in time to the days just after the Civil War. We met many well known heroes from history. 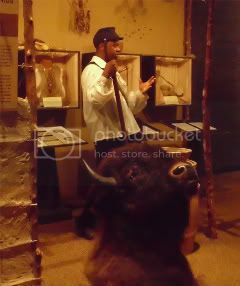 We also met a Buffalo Soldier, someone we’d not known much about that encouraged us to spend our week digging a bit deeper. After the Civil War, Congress passed a bill to establish a peacetime regiment. The result was four infantry and two Calvary troops of African Americans that came to be known as the Buffalo Soldiers, many of which were freed slaves. The nickname ‘Buffalo Soldier’ originated from the Comanche and Creek Indians who, though enemies of the Buffalo Soldiers, admired their fearlessness and courage, qualities the Indians believed the roaming buffalo possessed. The name also came because the Indians thought the soldiers’ hair resembled the tuft of hair on the bison’s head. After talking briefly to the presenter after his presentation, we learned that the Buffalo Soldiers had actually camped in Huntsville. In fact, there is a memorial erected in their honor. Of course I couldn’t stay away! Located just off University Drive on the grounds of the Academy for Academics and Arts is displayed one of three Buffalo Soldier memorials in the US—the only memorial East of the Mississippi River. Other memorials can be found in Junction City and Leavenworth- both in Kansas. At the end of the Spanish American War in 1889 many troops from the 10th Calvary were assigned to Camp Albert G. Force after the city of Huntsville petitioned Congress to allow the troops to station there while recovering from malaria and battle wounds. The location of the camp became known as Calvary Hill. The 10 foot tall, 35,000 pound black granite base tells the story of the Buffalo Soldiers. There service was an integral part of the Westward Expansion, as they protected settlers from Indian and bandit attacks while stringing telegraph lines across the West. The bronze statue depicts the likeness of 10th Calvary Sgt. George Berry riding his horse up Cuba’s San Juan Hill carrying the United States flag. Though the Buffalo Soldiers often received inferior horses, supplies and living conditions, they received 23 Medals of Honor, a hint of their courage and bravery. The Buffalo Soldiers remained segregated in service until the late 1940’s when President Harry S. Truman signed an executive order to integrate the armed forces. If you happen to find yourself near Huntsville, Alabama you can see the Buffalo Soldier Memorial for yourself at 2800 Poplar Avenue in Huntsville. Have you been on a field trip lately? You can link up to Field Trip Friday so we can learn right along with you. You’ll find the guidelines here. If you’re already familiar to Field Trip Friday you can link up below. Until next time~ Happy Field Trippin’! @Carrie–how long will you be in Huntsville–you'll be here for weeks, right? lol I'll send you an email later today with some ideas. That's pretty cool. We're supposed to visit Huntsville in late May-early June, so I would love any good field trip ideas! I think you have my email from my link up to Field Trip Fridays. Very cool. My son is interested in the Spanish American war, so I'll have to send him here to read up!